From a distance you can see the face that serves as the namesake for this park, and up close you’ll find amazing views, native wildlife, and the famous mile-high swinging bridge. Photo by Jason Tarr. Grandfather Mountain is an iconic peak 75 miles north of Asheville, N.C. just off of the Blue Ridge Parkway in Western North Carolina. The area is known for its incredible vistas and unmatched ecological diversity. On a clear day at Grandfather Mountain (elevation 5,945 feet), you can see the Charlotte skyline 90 miles away. The area is called Grandfather Mountain because of early pioneers who recognized "the face" of an old man on one of the cliffs. The easiest way to experience Grandfather Mountain is by exploring the family-friendly, non-profit park attraction (not a state or national park), which provides access to the famous Mile High Swinging Bridge, wildlife habitats and nature museum. Included in the park is Forrest Gump Curve, the scene of one of the locations where Tom Hanks&apos; character runs in the movie Forrest Gump. The backcountry area adjacent to the private attraction is known as Grandfather Mountain State Park and is most often accessed by experienced hikers. 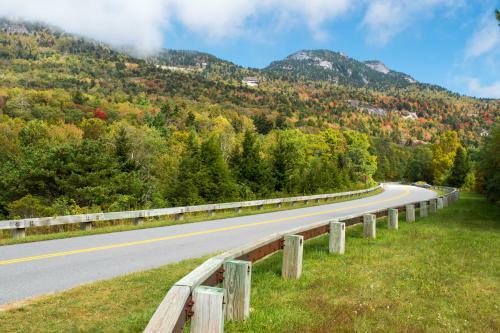 Mile High Swinging Bridge — As the name suggests, the Mile High Swinging Bridge is a mile above sea level and offers you a thrilling platform for admiring the 360-degree panoramic views at Grandfather Mountain. Cross the bridge to reach Linville Peak. The bridge is America’s highest suspension footbridge. The Grandfather Mountain Mile High Swinging Bridge is located at the top of the Park. Wildlife Habitats — Just below the top of the Park, you’ll find seven environmental habitats that are tucked behind the museum and restaurant. These habitats give you the opportunity to see elusive wildlife such as black bears, bald eagles, river otters and elk. Unlike exhibits found in zoos, these enclosures were built around the animals’ native habitat. Nature Museum — Explore more than two dozen exhibits designed to share the natural history of Grandfather Mountain and the surrounding area. Among the exhibits, you’ll see a fine collection of North Carolina gems and minerals, Native American artifacts found on Grandfather Mountain and photo displays. 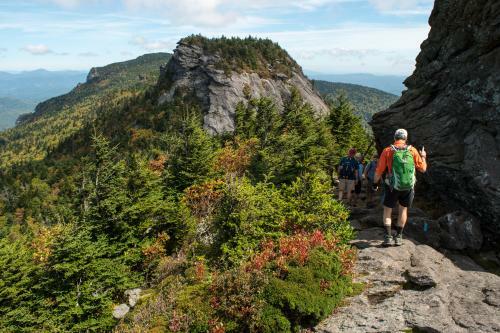 Hiking — The network of 11 trails at Grandfather Mountain will take you through gentle forests and across rugged peaks. For the most experienced hikers, the Grandfather Trail is considered one of the most technical hikes in the southeast. Using a series of ladders and cables, this trail takes you 2.4 miles from the Mile High Swinging Bridge to Calloway Peak. Hikers often choose to take the Grandfather Trail out and return back on The Underwood Trail, a strenuous trail with just one ladder. There are backcountry trails that may be accessed for free from outside the Park. Picnicking — With more than 100 picnic tables to choose from and grills scattered throughout the Park, Grandfather Mountain is the perfect place for a scenic picnic. Events — Grandfather Mountain hosts guided nature hikes, the Grandfather Mountain Highland Games and photography clinics among many other events throughout the year. COST: Admission is required to enter Grandfather Mountain. Admission rates: $20 for adults, $18 for seniors (60+), $9 for children and no charge for children under age four. Grandfather Mountain&apos;s backcountry trails (which link to the Park&apos;s Mile High Swinging Bridge) may be accessed for free from outside of the Park attraction. However, these trails are long and strenuous hikes that typically require most of the day to complete. There is no shuttle available. Should you choose to have someone pick you up in the Park, admission applies. HOURS: Grandfather Mountain is open 7 days a week throughout the year. Hours vary by season but Grandfather Mountain typically opens by 8 or 9 a.m. Please see the Grandfather Mountain web site for seasonal hours. WEATHER: Given Grandfather Mountain’s high elevation, weather can often be quite different from lower lying areas. Dress in layers and be prepared for shifting weather conditions. HIKING: Access to the State Park trails from the Swinging Bridge area is included in admission. You may access some backcountry trails for free from off-mountain trail heads on NC Highway 105 or the Blue Ridge Parkway. ACCESSIBILITY: Much of Grandfather Mountain is accessible to those with limited mobility. For example, the "Top Shop" at the summit provides elevator access to the Mile High Swinging Bridge. It is a few hundred yards from the building to the bridge, and one bench is located near the bridge. CHILDREN: Grandfather Mountain park is a family-friendly attraction, including for toddlers. Parents are encouraged to supervise children at all times and exercise caution, especially on the Mile High Swinging Bridge. PETS: Dogs are permitted in the Park as long as they are on a leash. They are not allowed inside of buildings due to health regulations. REACHING THE PARK: If the Blue Ridge Parkway is closed due to inclement weather, Grandfather Mountain is still accessible from U.S. Highway 221. From downtown Asheville, take I-240 to I-40 E. Take Exit 85 toward Marion. Turn left at the bottom of the ramp and go one mile to the stoplight. At the stoplight, turn left and follow US Highway 221 North for 30 miles to the entrance of Grandfather Mountain. Grandfather Mountain can also be accessed from the Blue Ridge Parkway by exiting the Parkway at milepost 305. Grandfather Mountain was formed by plate tectonics. The Appalachian Mountains, where Grandfather Mountain is located, were formed by the collision of two continental crusts. Erosion over hundreds of millions of years has created the landscape we see today. The Cherokee named the mountain, "Tanawha," meaning Great Hawk or Eagle. Early pioneers named the mountain "Grandfather" after recognizing "the face" of an old man in one of the cliffs. In 1952, Hugh MacRae Morton became the sole owner of Grandfather Mountain. He widened the road to the summit and pushed for the building of the Mile High Swinging Bridge. It was in the late 1980s when Morton and Grandfather Mountain began working with the North Carolina chapter of The Nature Conservancy to preserve 1,460 acres of the mountain’s wilderness backcountry. In 1987, the Linn Cove Viaduct, an engineering marvel, was completed to complete the Blue Ridge Parkway. The viaduct is an elevated roadway that hugs Grandfather Mountain but preserves its beauty and protects the great biodiversity found on the slopes. After Morton&apos;s passing in 2006, his heirs vowed to continue his mission of protecting Grandfather Mountain. In 2008, they announced the sale of the backcountry to the state of North Carolina for a state park. In 2009, the Morton family began the process of transferring ownership of the Grandfather Mountain attraction to the non-profit Grandfather Mountain Stewardship Foundation.